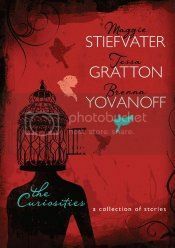 The Curiosities started out as a collection of short stories that Maggie Stiefvater, Tessa Gratton, and Brenna Yovanoff were writing on their blog, The Merry Sisters of Fate. I don't know that they even intended for these to be printed, but they were there for the public to read, for the three authors to practice and possible write things stories that were not their normal fare. However, what really makes this collection stand out, at least to me, is that each of the three authors were asked to go through and mark up a manuscript, jotting down their notes, thoughts, and critiques on their own and each others' stories. There are notes written to each other, little doodles, inside jokes, and other fun facts strewn throughout the stories. I had almost as much fun reading their notes as I did reading the stories. Now, I have books by all three authors on my shelves, but I've never gotten around to reading any of them, but when Maggie Stiefvater was doing a signing at my local indie, Schuler Books, they had this for sale, and it seemed like such a clever idea of a book, I decided to pick up a copy. Needless to say, I know want to read at least one book by each of the authors by year's end. I so thoroughly enjoyed working my way through this collection that I would like to see what each author can do with a full length novel. Nothing against the other two authors, but I think I found myself enjoying Yovanoff's stories the most. There was something about her writing and storytelling that just really clicked with me and I think I'd like to start one of her books sooner rather than later. Overall, an excellent collection and highly recommended!